The experts have called it; many of us have seen it. The future of work is the “gig economy”. The 21st century synonym for a “job” is a “gig”—a project, task or project you are hired to do for a defined period of time. Office-based 9-to-5 jobs used to be the norm but the Internet and the start-up economy have disrupted traditional ways of doing business and by default, ways of being employed. Experts predict that “gigsters” who may also be called other names like freelancers, consultants, or independent think tanks and design firms will be the future of work. A LinkedIn study showed that by 2020, an estimated 40% of workers in the United States labor force would be “gigsters”. Are you ready for the gig economy? How can you future-proof your income? 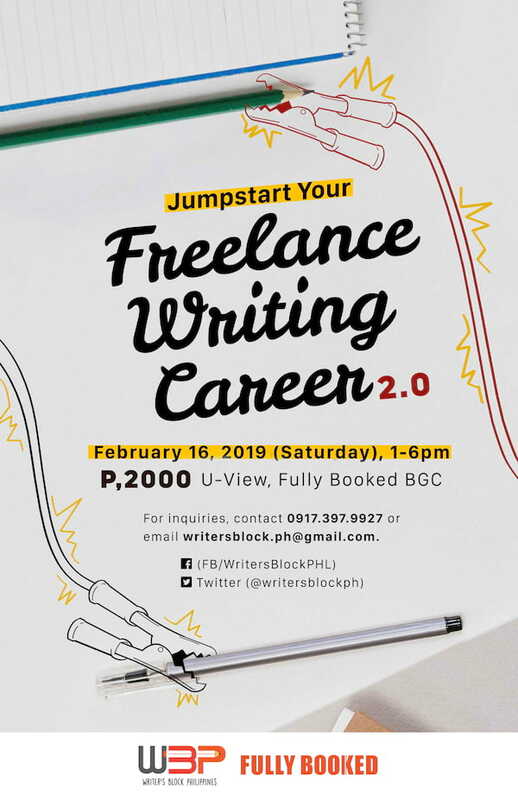 One way to do it to sign up for Writer’s Block Philippines’, Jumpstart Your Freelance Writing Career 2.0 happening on February 16, 1-6pm in Fully Booked Bonifacio Global City, Taguig City. In this half-day event, you’ll learn how writing can lead to a career as a “gigster”. The speakers will share industry tips about getting started, getting noticed, and getting paid. Featured speaker, Karen Ferry-Fernandez, will divulge her own tried and tested tips to survive in this industry. She started as a copywriter who made her way up the ladder and became an Executive Creative Director in multinational advertising agencies. She’s currently a full-time independent professional and has been so for the last 10 years. Registration is now open for “Jumpstart Your Freelance Writing Career 2.0”. Aspiring writers are welcome to attend the event; no need for any professional experience here. Please note that participants should be at least 18 years old. For inquiries and reservations, email writersblock.ph@gmail.com or contact +63917-397-9927.